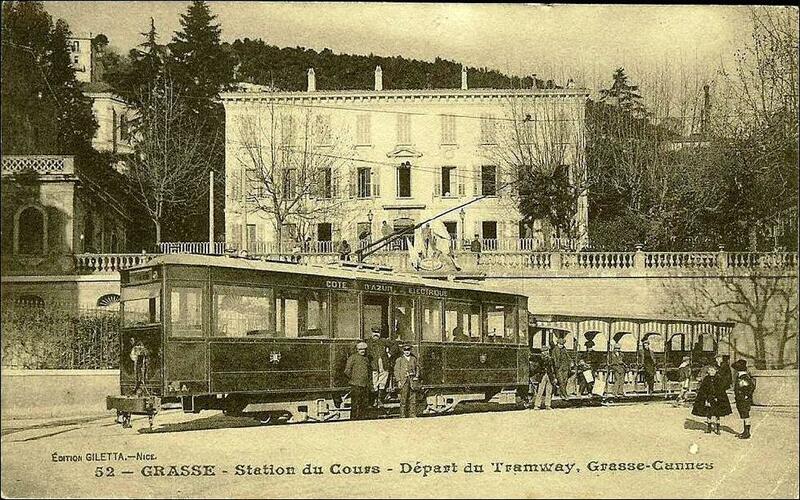 We start the journey on the tram from Grasse PLM Railway Station. The map below shows the different tramways in Grasse and the route of the PLM line from Cannes. 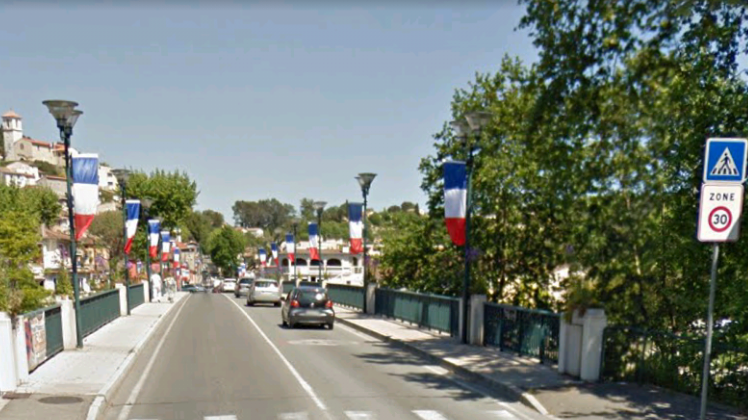 The blue line on the map is the route of the Chemin de Fer du Sud. 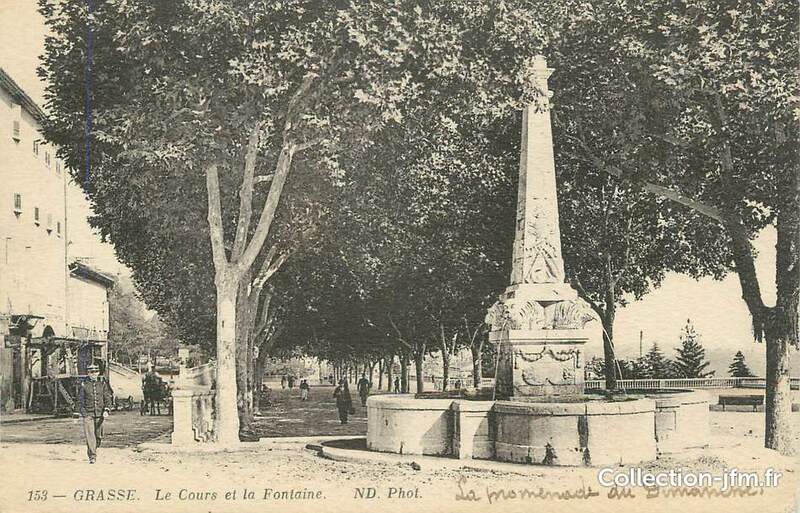 Its station was located on what is now the Avenue de Provence to the East of the tunnel at location 2. 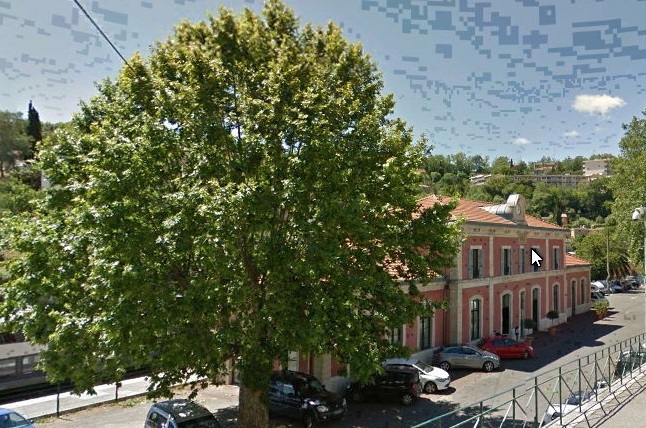 Point 7 on the map is the lower funicular station and the station on the PLM line. 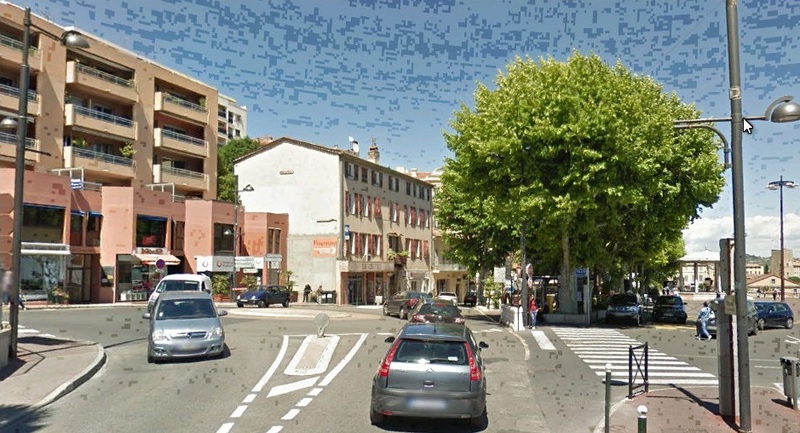 Point 6 is the lowest point on the TAM tramline within the town and the pink line rises through the town to Point 8 which is the La Cours and which is close to the old town of Grasse. 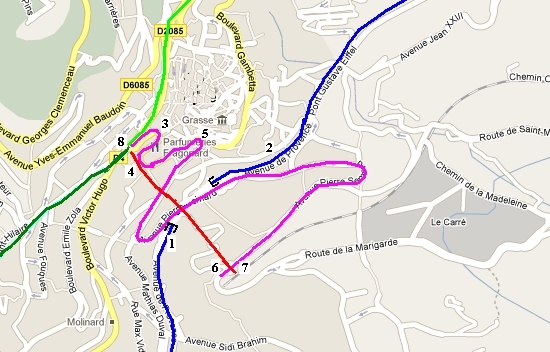 Here there is an intersection between the funicular the TAM tramway via Pre-du-Lac to Cagens-sur-Mer (in light green) and the TCA tramway to Cannes  which is shown in darker green. 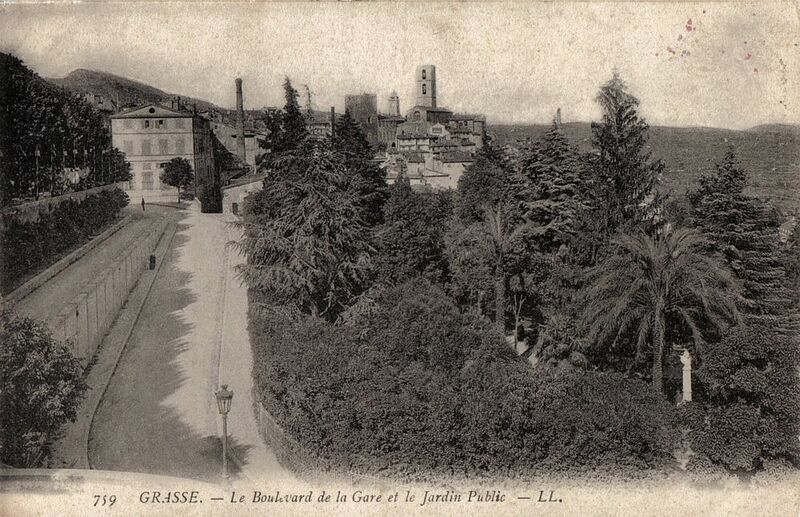 Grasse Town Centre Tramways and Railways. 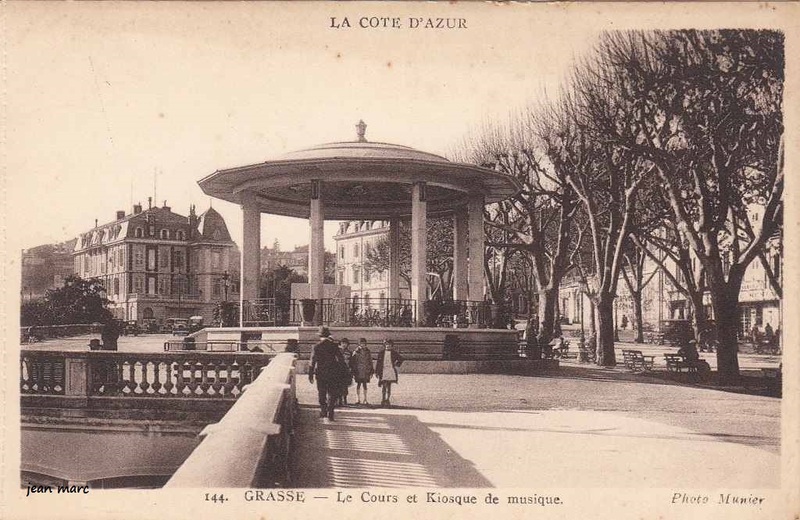 Within Grasse, the TAM tramway ran from close to the Gare PLM (pictures below) up Avenue Pierre Semard round a tight hairpin bend and continued up hill to meet the line of the Chemin de Far du Sud (now Avenue de Provence). 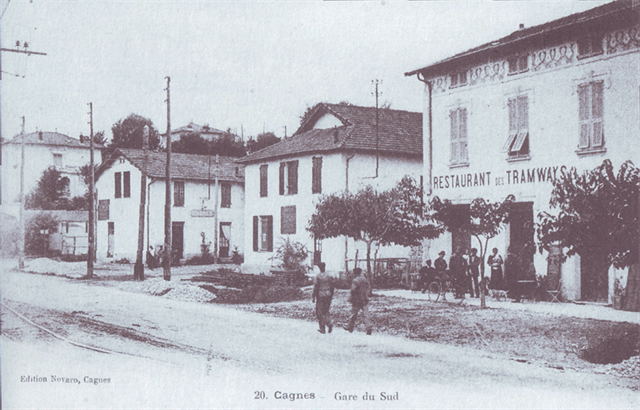 There was a short spur of the main route to allow some tram services to terminate at the Gare du Sud. 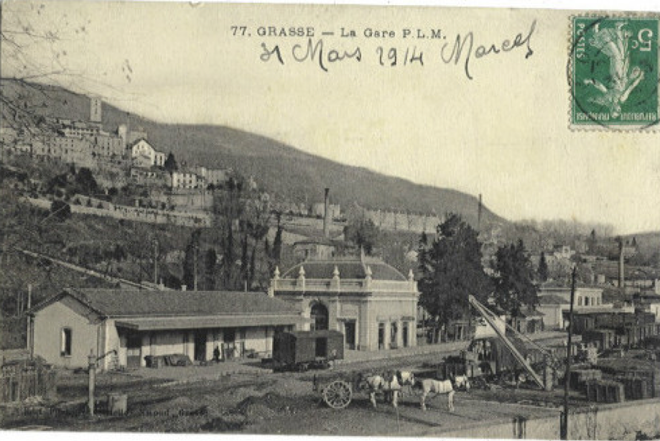 The Gare PLM platform ran from the station building along to the funicular station which is also shown on the pictures above. 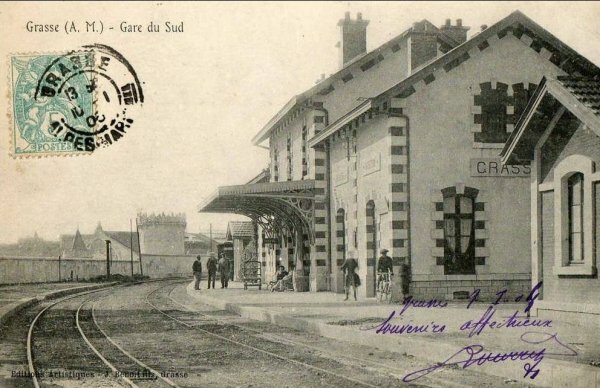 The Gare du Sud has been demolished to make way for a modern apartment block, the Gare PLM remains although the station building is no longer the main focus of the station. 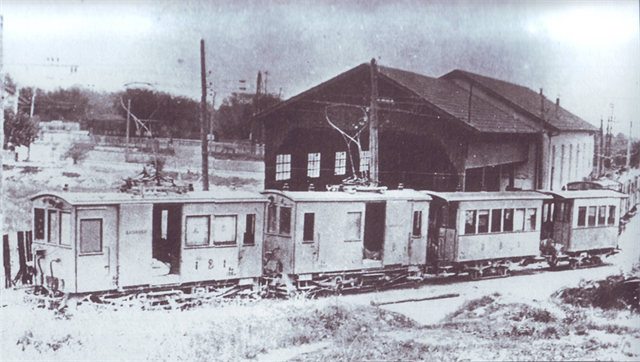 There is a modern building at the end of the railway tracks as shown above. 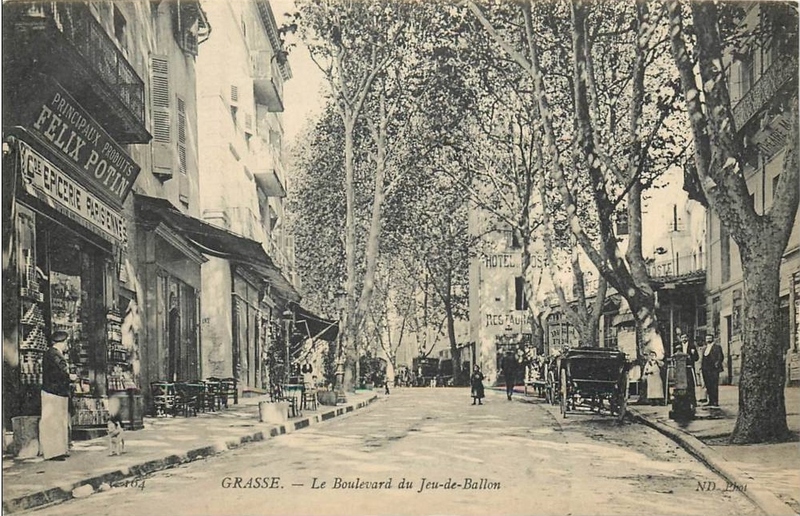 After leaving the Gare du Sud the tramway continued to climb up through the town of Grasse along Avenue Pierre Semard and then turning tightly onto Boulevard Carnot, then tightly again to the left onto Boulevard Fragonard and winding its way up to La Cours. 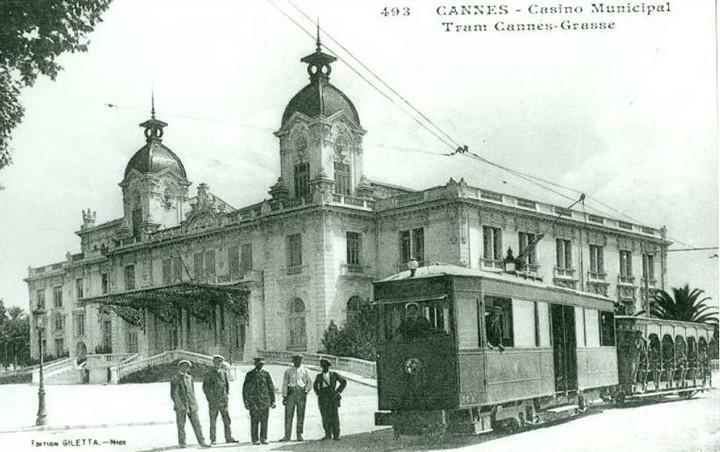 At La Cours it would have been usual to disembark the tram which had brought you up from the town and to chose either to board a tram on the TAC to Cannes or the TAM to Cagnes-sur-Mer or Le Bar-sur-Loup. 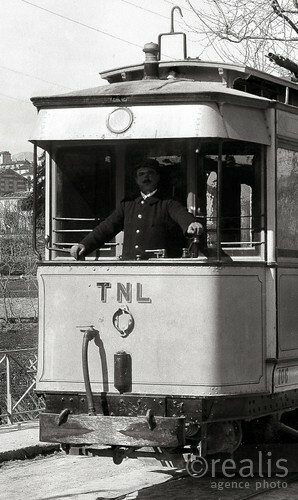 Aboard a TAM tram for Cagnes or Bar-sur-Loup you would have set off Eastwards on La Cours and then Route Napoleon and along the streets of the old town of Grasse before turning approximately north-eastwards and heading along Avenue Thiers and then east along Avenue Victoria following the modern D2085 road out of Grasse which becomes Avenue Francis de Croisset, Avenue Pierre Ziller and Avenue Auguste Renoir. 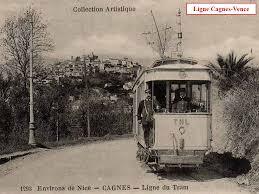 By the time the tramway rached the Route de Nice it had crossed over the line of the Ligne du Sud which had been travelling parallel to it about 100 metres further south down the hillside. 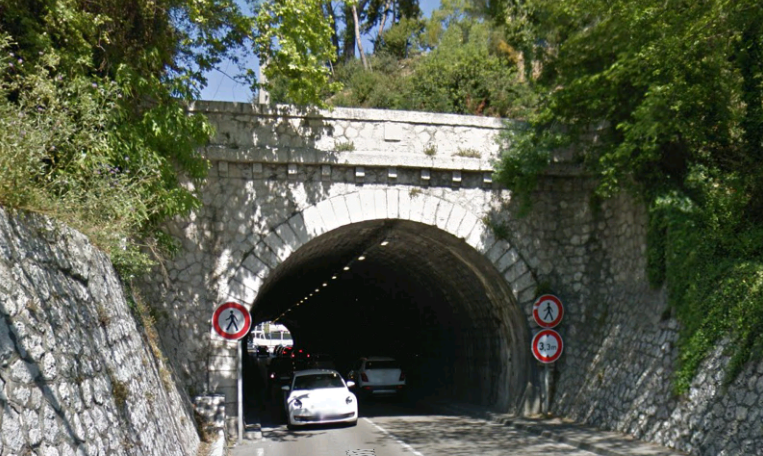 At the point where their routes crossed the Ligne du Sud was in tunnel under Chateauneuf. Leaving Chateauneuf the tramway followed the D2805 Route de Nice to Le Colombier and at a point where the D2805 turned northwards at Le Colombier, the tramway continued in a south-easterly direction. 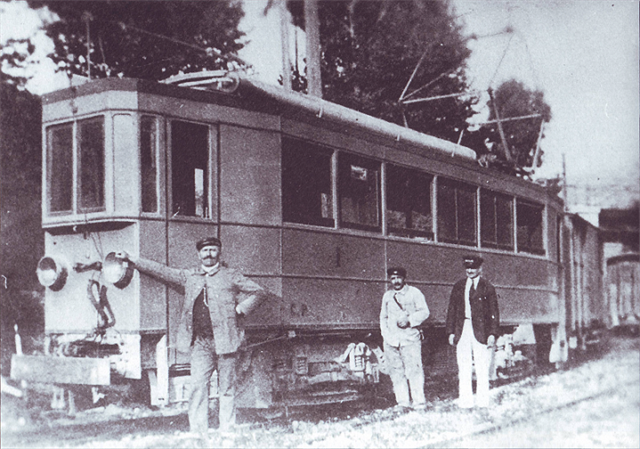 Its route is now called the Chemin du Tramway. 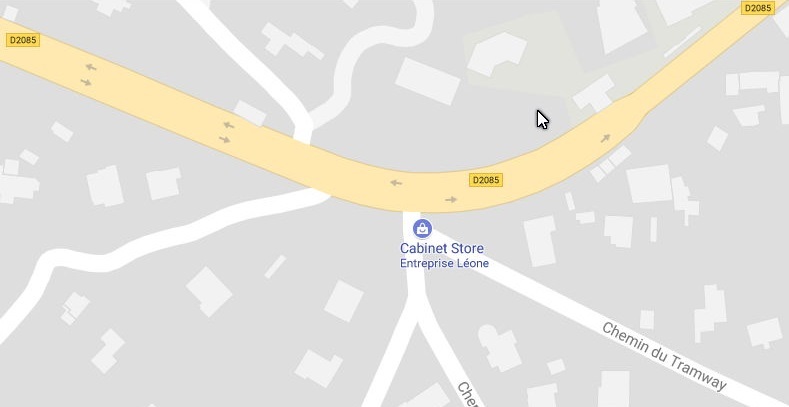 The route is marked in yellow on the larger map and shows that rather than following the contours the line was dropping down towards Les Sept-Fonds. 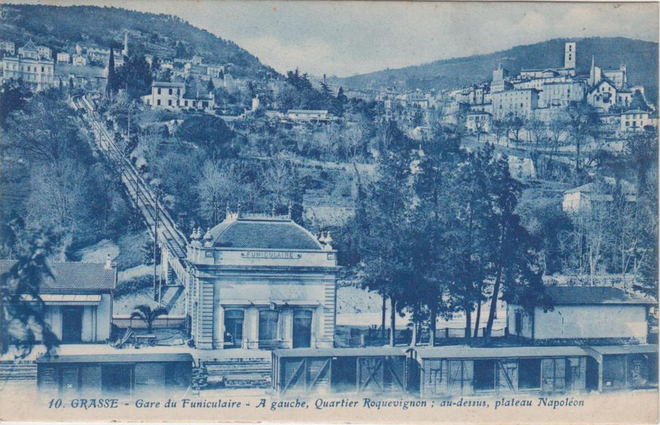 Details of the viaduct at Le Sept-Fonds can be found by following this link: https://rogerfarnworth.wordpress.com/2017/11/28/the-tramway-between-grasse-and-cagnes-sur-mer-part-1-chemin-de-fer-de-provence-20. 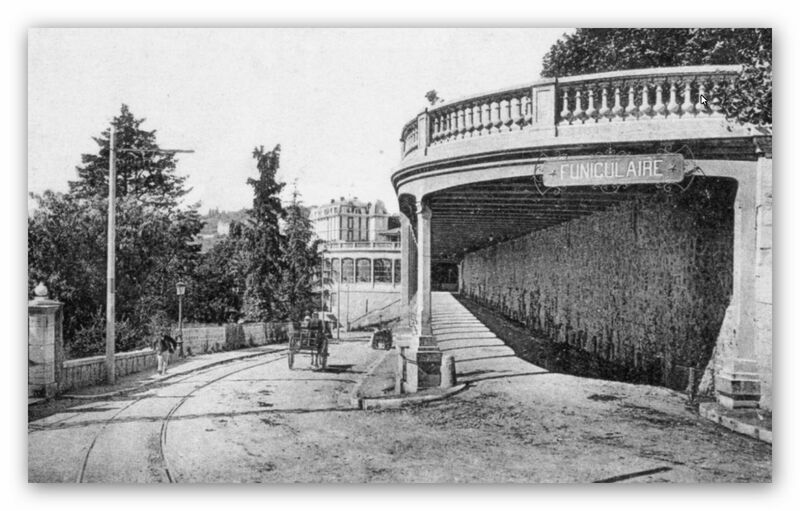 The line continued on a downward grade rejoining the line of the modern D2805 and curving northwards before reaching the Viaduct de Cloteirol (the Pont des Vignes). 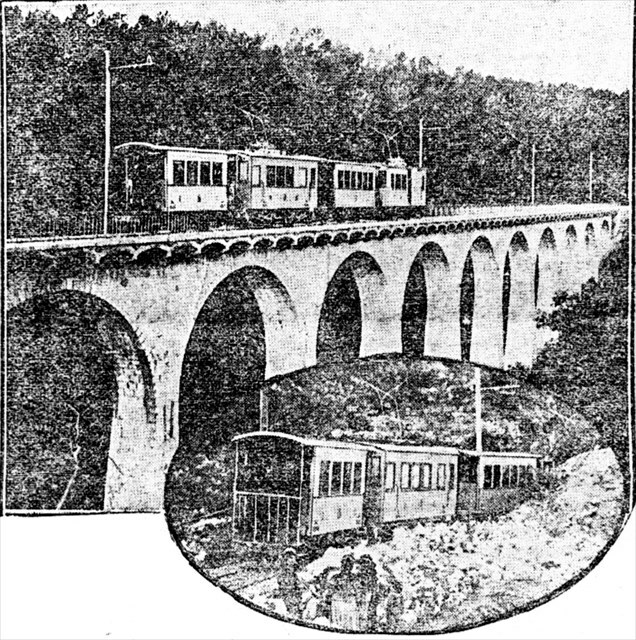 At this next viaduct the tramway took a sharp turn through 90 degrees. 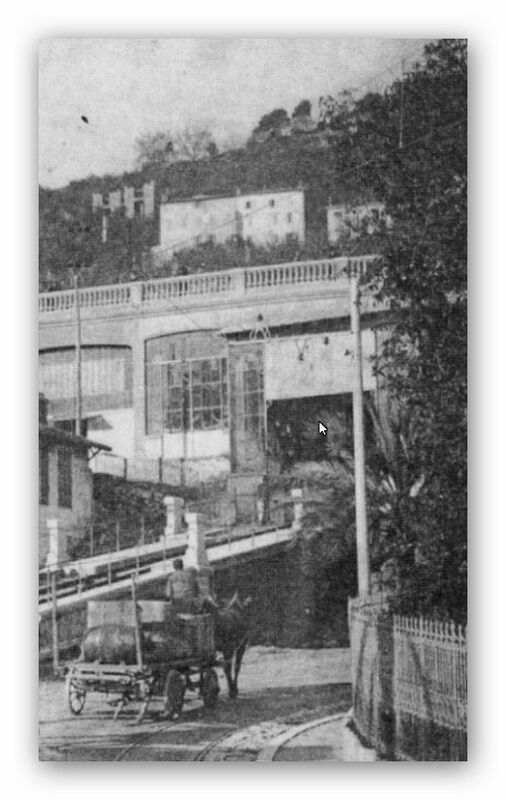 This combination of a very tight curve and a steep grade led to the worst disaster on the tramway network on the Copte d’Azur. 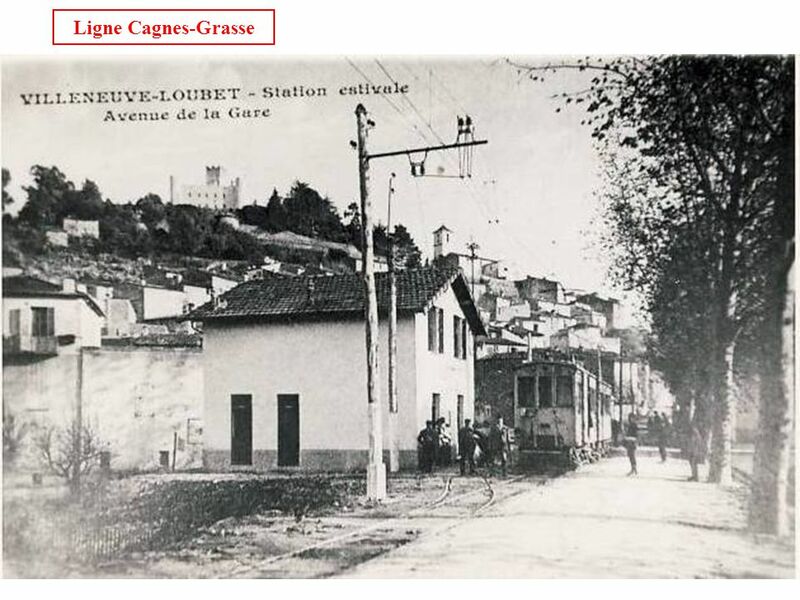 The story is told on the previous post in this series (https://rogerfarnworth.wordpress.com/2017/11/28/the-tramway-between-grasse-and-cagnes-sur-mer-part-1-chemin-de-fer-de-provence-20). 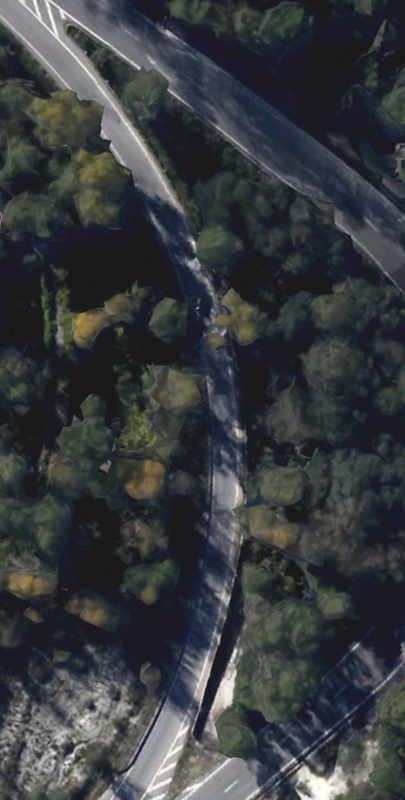 The remains of the Viaduct can just be picked out in the adjacent Google Earth screenshot. 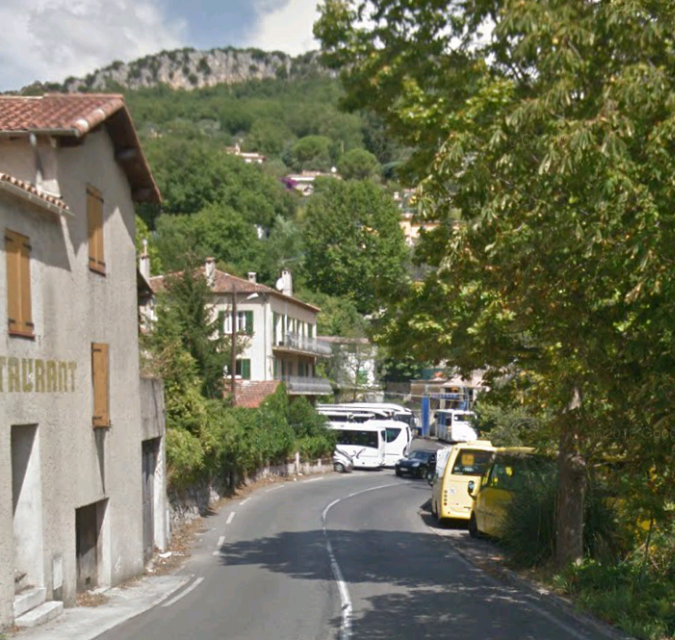 At Pre du Lac a short 3 kilometre spur ran to Le-Bar-sur-Loup. It left the main line to follow the Route du Bar. 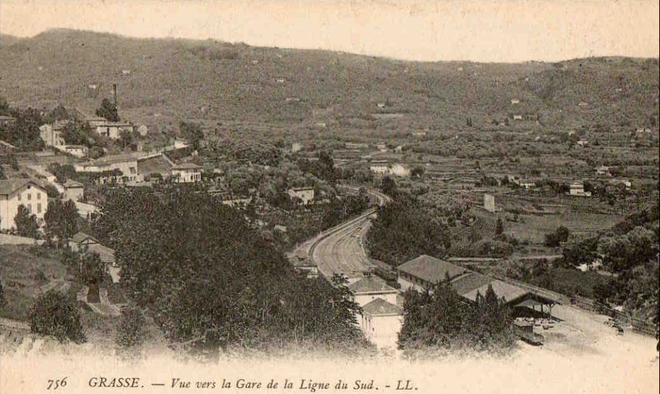 The spur followed this road which ran along the hillside only a short distance above the Ligne du Sud until it entered the Commune of Le-Bar-sur-Loup. 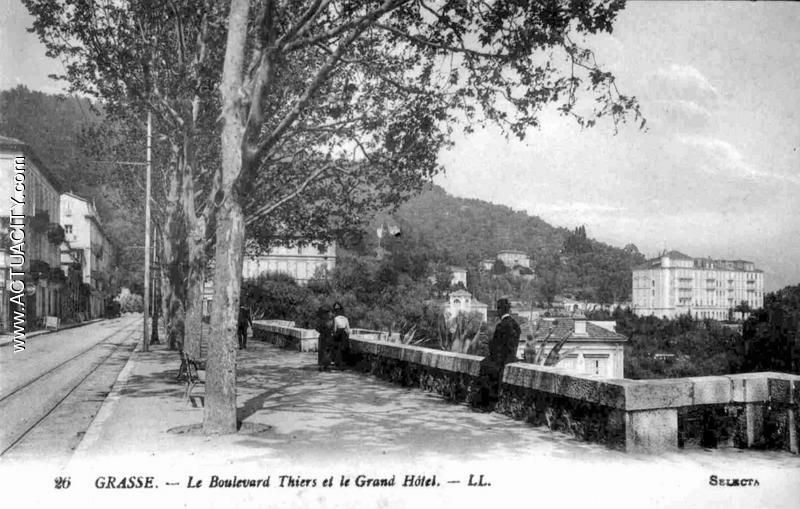 At that point the road became the Route de Grasse and the tramway continued to follow it round the head of the Vallon de Riou and on into Le-Bar-sur-Loup. 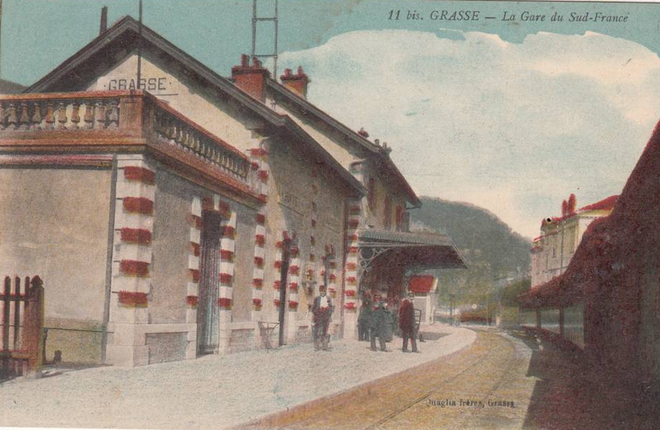 A few older postcard images of the line. 2. 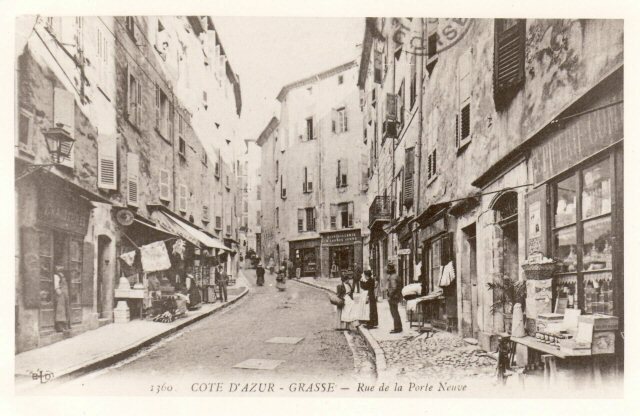 Photograph from the AMTUIR Collection; http://www.amtuir.org/03_htu_cp/03_reseau_france_cp/cannes_tca_cp/images/06_GRASSE_TRAM.htm, accessed 21st March 2018. 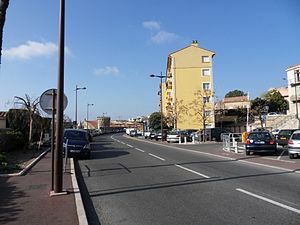 This entry was posted in Railways and Tramways Around Nice, Railways Blog on November 29, 2017 by rogerfarnworth.